When something goes bump in the night . . . it’s most likely a plumbing problem, or something equally mundane. But fake medium Eleanor Wilde is happy to investigate and cleanse your home of spectral presences—for a fee. Hey, it’s a living . 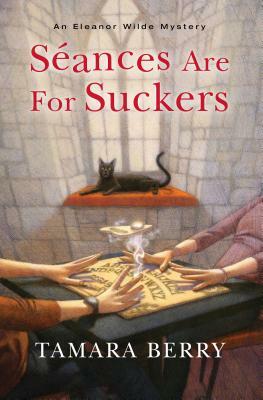 . .
Ellie has an ailing sister to care for, and working as a ghost hunter who doesn’t believe in ghosts helps cover the bills for both of them. When she’s lucky, it also pays for the occasional tropical vacation. Her brother doesn’t exactly approve, but Ellie figures she’s providing a service. On her latest job, though, she may be in for some genuine scares. The skeptical, reserved, and very rich Nicholas Hartford III has flown her all the way to his family’s ancestral estate in England—supposedly haunted by a phantom named Xavier. Nicholas thinks it’s all just as much a crock as Ellie’s business is, but the fact remains that something is causing the flashes of light, mysterious accidents, and other apparent pranks in the chilly, eerie castle. His mother is sure that Xavier is real, and he’s willing to employ Ellie if she can get to the bottom of it and put a stop to the nonsense. Tamara Berry is a part-time author and part-time freelance writer/editor. She has a B.A. in English Literature from Eastern Washington University. In addition to books, she has mad love for all things TV, movies, and pop culture. Visit her at www.tamaraberry.com.